[AUTO](RC) Ritual 3 (Active if there are three or more grade 1 cards in your drop zone):When your other grade 1 unit is placed on (RC), if you have a vanguard with the ritual ability, that placed unit and this unit get [Power]+3000 until end of turn. 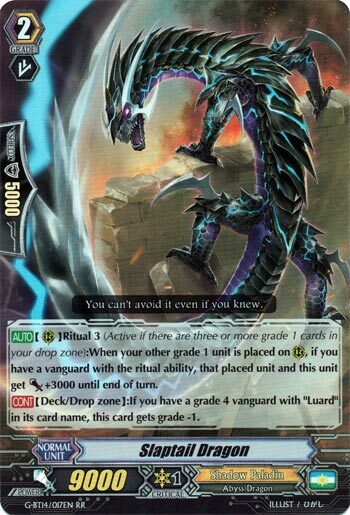 [CONT](Deck/Drop Zone):If you have a grade 4 vanguard with “Luard” in its card name, this card gets grade -1. So we’re wrapping up G-BT14 before we get our annual deluge of mermaids (*shudder*) so let’s make this reasonably quick. Slaptail here doesn’t QUITE work as free fodder…or not that free, as he can’t make Ritual live until you actually Stride, which Morfessa can do, but you want him for the first skill. You call him either through Dragfall or just manually from hand, make with the calling with Dragabyss and just make huge columns that way. This makes him an excellent target for Stand Triggers, so you have an excuse to run him with Ultima at least. Useful enough. Can’t proc free Stride fodder but Luard decks speed through enough drop zone so it shouldn’t matter.